George, Bishop George’s wife, Sheila, and their eldest son, Christopher. 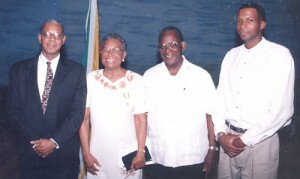 Former Anglican Bishop of Guyana, Randolph George has died, according to usually reliable sources. The Anglican Diocese could not be immediately contacted, and it was yet to announce Bishop George’s passing. Sources said he died at his home at Peter’s Hall, East Bank Demerara on Sunday, July 17, 2016. He served as Bishop of Guyana from 1980 until 2009. He was at one time Chairman of the Integrity Commission, a body to which public office holders are required to submit declarations of their assets. Sources said Bishop George died while the Anglican Church was preparing to honour him and Canon Thurston Riehl for their more than 40 years service to the ministry.